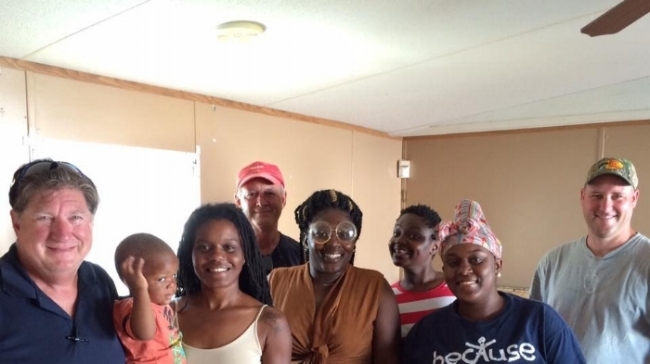 This past weekend I had the chance to be a part of a Six Man Gang that was invited by CHOA (Children's Healthcare of Atlanta) to come to the aid of a single mom whose mobile home had been squashed by a tree almost a year ago, making her domicile uninhabitable. We learned of this family's plight a few months ago, but have just been able to put together a team to see about getting her back home. Her young son, Rocky is in a fight with Cancer so having their own place again would be very helpful in giving him a chance. As you might imagine, a mobile home, after sitting for that long, with a large hole in the roof exposed to the elements, made the issues multiply. I don't know if we have ever walked on to a site and considered walking away, thinking that it is just too much for us to handle but those thoughts definitely crossed our minds this weekend. The task was daunting. A gaping hole in the roof, splintered rafters, infested with fleas, mildew, and black mold. We paused and then decided to put our heads down and get to work. We got close to doing all that we hoped we could, but it was more that we could handle in the two days we had. The following Friday, our "Swat Team" got up early, drove 3 hours to Pelham, GA, worked tirelessly to finish the trailer repairs for Tiffany and her sons and limped back home. A 19 hour day! Big, big thanks to Frank Lewis, Darrell Davis, Chuck Rigdon and John Walsh for a job well done! It was a job that we thought may not be able to be completed, but nothing seems to be impossible these days! After a year of being displaced, this young single mom and her sons are back home.